With its sweeping shapes and chrome or chrome/gold look, Axor Carlton is reminiscent of the days of the glamorous grand hotels of the 1920s. A nostalgic collection from Phoenix Design that outlives all trends. Axor Carlton combines retro design with the contemporary ease of use offered by a modern mixer. Several variants are available for the wash basin: single lever mixers, classic mixers with two lever handles or versions with stylish star handles. The opulent design is also evident in the mixers and thermostats for showers and bath tubs. Here we also typically have porcelain inlays in the control units featuring the traditional inscription “H” for hot and “C” for cold. In the shower, the Axor Carlton showerpipe combines overhead and hand shower with the convenience of a thermostat. The hand shower's nostalgic design with its white handle is reminiscent of classic models. Overhead showers in various sizes and a shower set are also available. 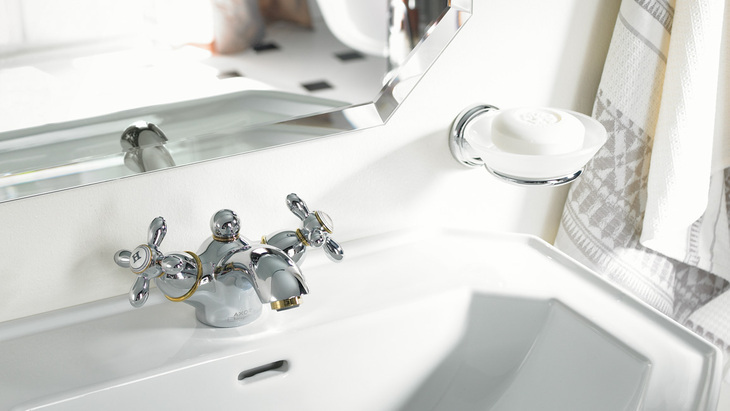 Axor Carlton accessories contribute to the sense of luxury in the bathroom. The range includes a glass shelf, wall light, soap dish and lotion dispenser, towel holders, hooks and lots more. Which wash basin matches Axor Carlton?